This last weekend I also performed strolling interactive at a holiday party for a Audio Visual company based out of Eden Prairie, Minnesota. 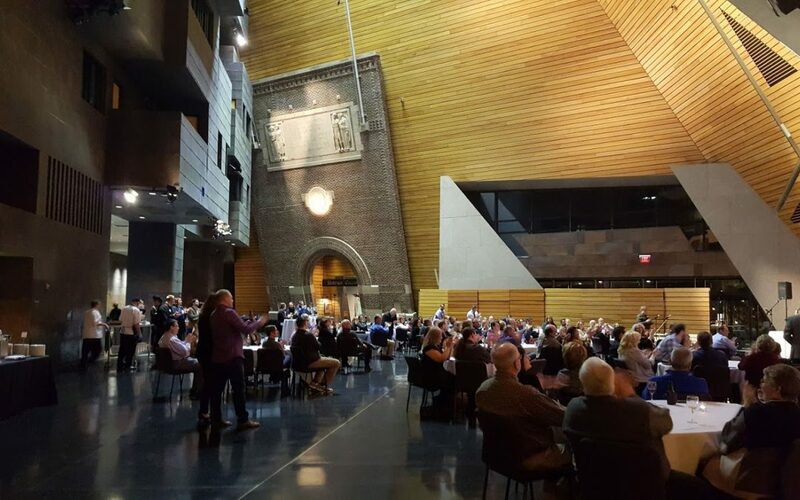 The party was held at the McNamara Alumni Center located on the University of Minnesota Campus. The McNamara Alumni Center was built in 2000 and is one of the more architecturally interesting building in Minnesota. It contains two parts. One part is the offices for the University of MInnesota and the other part is event space. The architect was Antoine Predock. This event space will definitely give your guests that WOW effect if that is what you are going for. It is located on campus so parking can be a pain but some groups will rent spaces at the nearby garage for their guests which is what they did this last weekend and with the cold weather that is coming through Minnesota it was appreciated. This venue gets 5 stars from local event and meeting planners and is a gem! For your next event in Minneapolis, Minnesota please check out mac-events.org and don’t forget to reach out to magician David Farr for your cocktail reception or social time.